Virginie Syn is Artlyst’s roving art correspondent. As an international art insider with a respected eye for what’s new Virginie has uncovered six of the best from her latest whirlwind tour of the globe in May 2016. Spring started with a good round up of Art events and fairs and I found myself on the road again, busily meeting artists, discovering new talents and making new friends. Cologne. Such a nice city, more for its people (and its cathedral) than its architecture, I have to admit. “The northern Italian city” as a Cologne collector described it to me when we were dining. Cologne is a city bursting with life, where the oldest art fair, Art Cologne, has been resurrected with Daniel Hug, the fair director, for the past 8 years at the helm. The fair was good, evidenced by the quality of its exhibitors, the artists shown and the collectors attending. The Cologne collectors are really educated and true connoisseurs, eager for proper conversations and discoveries. I was really lucky to be with the best host ever: Judy (Gerd Harry Lybke) from Eigen + Art. He embarked me on the funniest and Artiest of adventures, from underground artist previews to a collector’s castle, not to forget a proper (huge) German meal with his team. And I came across several artists I really enjoyed discovering. 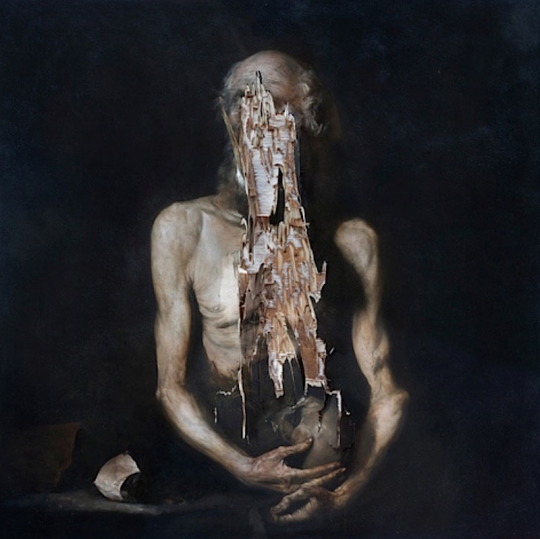 Italian artist, Nicola Samorì (Eigen +Art gallery), re-interprets 17th century Italian paintings: still-life, portraits and landscapes. He transfigures and sabotages the canvas, “to question classical representation and the medium of painting itself”. 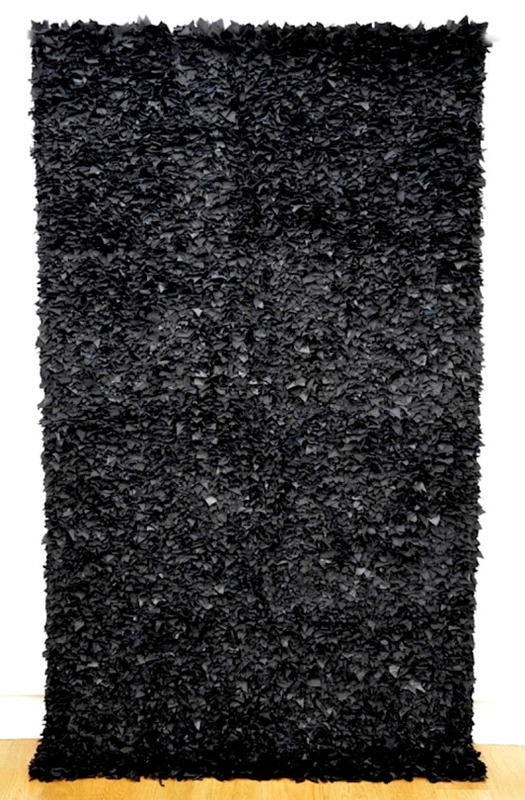 At gallery Produzenten from Hamburg, I found Olaf Metzel’s aluminium wall sculptures fascinating. In his work, which looks like oversized crumpled balls of newspaper, the artist comments and reflects on social and political issues of German society. Brussels : I spent a long and fulfilling day at Art Brussels. I had an epiphany when visiting Galería Sabrina Amrani from Madrid. I fell under the spell of Joel Andrianomearisoa’s poetic work which was intimate and fragile. The Paris-based artist from Madagascar creates light from black monochrome using fabric and paper as a medium. Berlin was my synesthetic moment. 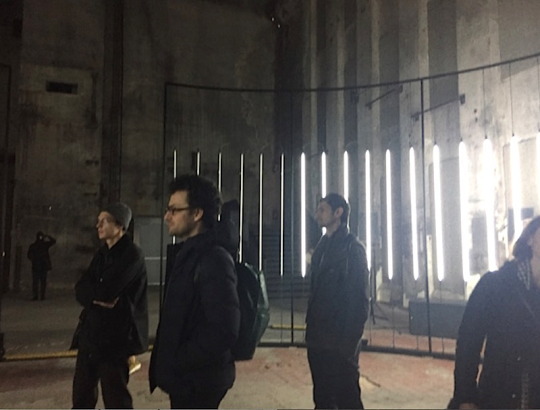 Attending Carsten Nicolai’s White Circle installation opening at the Halle am Berghain was mesmerizing : the “visualisation of sounds” . The whole experience was unforgettable, a recipe for success: the space (the legendary Berghain Club set in a former power station in Berlin), the light (a circle 4 meters in diameter, with dozens of evenly spaced vertical white fluorescent lights) and the sound (sixteen speakers playing different pieces by Carsten’s label including some ultra-precise abstract techno). Talking about sounds, I savoured spending time at Aldo Cristofaro’s studio where the Italian-born, Berlin-based artist is composing on canvas the most subtle and abstract work while listening to jazz, as if he was playing the instruments with the paint. I met Aldo years ago in Berlin and was impressed to see how his work has evolved, getting more depth and substance. New York. Frieze, indeed, but not only. I attended a party at the studio of Bosco Di Sodi (showing in London at Blain|Southern and in July at Eigen+ Art in Berlin). It’s one of the most incredible studios I have ever visited. 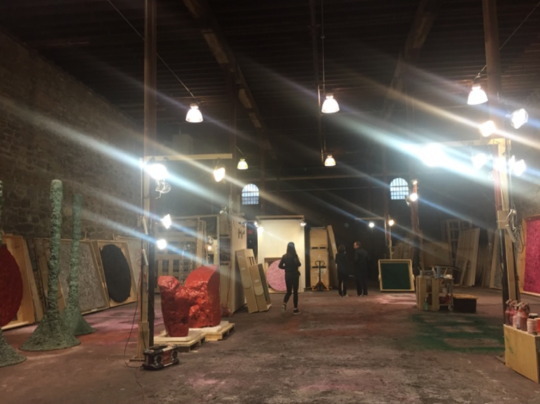 A massive warehouse on Red Hook’s waterfront in Brooklyn, an endless ceiling facing the Statue of Liberty … it can’t get better… Bosco’s works are layers of pigment, water, glue, and wood fibres. The outcome is incredible moon landscapes emanating an unparalleled energy, spiritual and yet sensual at the same time. 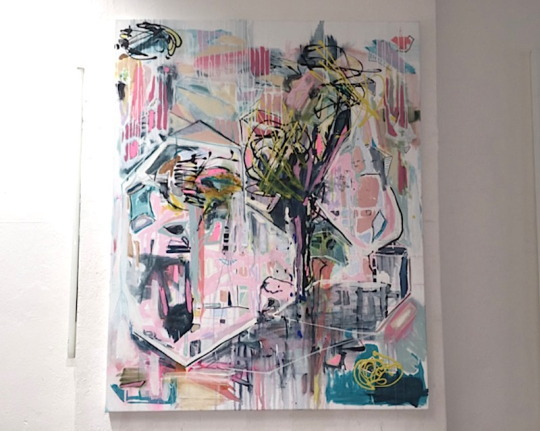 My next studio visit was at MarieVic’s, a young French artist I met the week before in Berlin. She welcomed me to her spotless studio in Chinatown, an oasis of calm and beauty in the bustling city. We spoke at length of her various projects, both past and the present, and how she likes dealing with ambiguity. I loved her playful, utterly aesthetic yet melancholic “Blowing Riccardo” multichannel video installation (exhibited in New York, Paris, Milan and Istanbul). She revives leftover and forgotten dresses from the iconic Givenchy designer, Riccardo Tisci. She gives them a second life by staging them in an aircraft storage facility in the Mojave Desert. I can’t wait to see her new project on Berlin. I also visited Chelsea’s galleries. Carmen Herrera at the new Lisson gallery was truly inspiring. The 101-year-old artist is finally having the recognition she deserves and is being acknowledged for her legacy in Art History: being a major artist of the abstract geometric movement. She will have a full retrospective at the Whitney in September – it’s already in my diary! Across the street, at Metro Pictures, Cindy Sherman was showing her new body of work since 2012, dealing with the aging issues women face. I went twice. I could not take my eyes off Sherman’s exquisite and daunting images of her playing the aging leading ladies of Cinema’s Golden Age. I ventured to Moma PS1 in Queens to see Cao Fei’s first museum solo exhibition. Her video, “Whose Utopia?” gave me the goose bumps. It is a very moving video which the artist realised during a residency in a Chinese factory. She asked factory workers to perform their fantasy lives in their daily working space. Right before leaving New York City, I had the privilege to listen to Beatrice Gross (co-curator of the exhibition with Claire Gilman) presenting Drawing Dialogues: Selections from the Sol LeWitt Collection at the Drawing Center: a “little gem” worth discovering in the heart of Soho. As I discovered, Sol LeWitt was not only the founder of conceptual art but also a passionate and avid collector. And now, London is calling and I’m back in my favourite city in the world, getting ready for Art16!